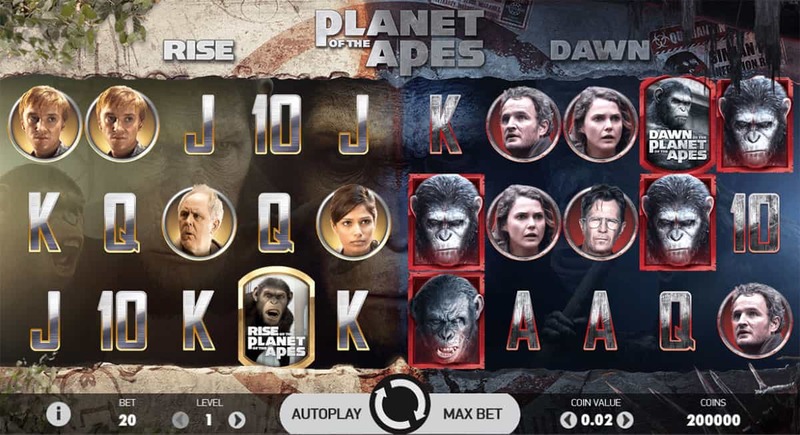 NetEnt is one slots studio that knows how to pull off an epic slot, and taking on the Planet of the Apes franchise stops nothing short of that. The intro lets us know exactly what kind of an action-packed ride were in for. Vigorous clips from the film involving the main characters of this tale introduce us to the saga. It is the game’s unique reel set design, multitude of bonus features and mammoth jackpot that will truly hook us in. Edge of the seats at the ready. Two sets of five reels and two sets of 20 pay-lines give us an innovative game space, with Caesar the ape taking centre stage and splitting our reel sets down the middle. The Rise reel set - on our left - is lighter, more optimistic, while the Dawn reel set echoes the grim battles that formed the basis of the second film. Other main characters of the movies make up our high-paying symbols, while more standard 10s through Aces bring up the rear as our low-payers. 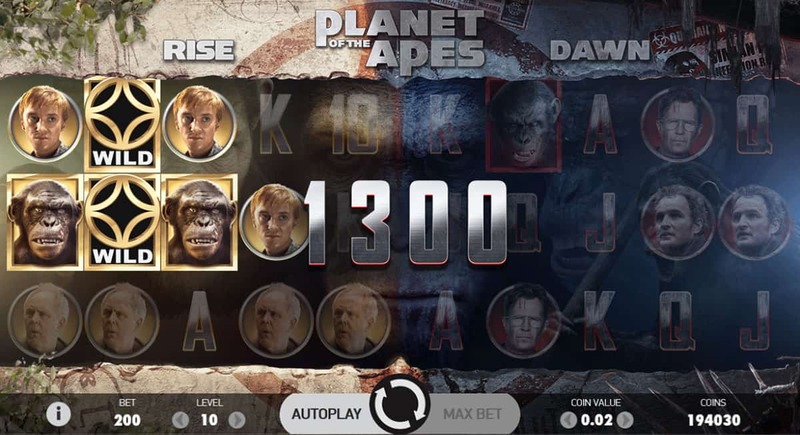 It is when we score big wins or launch any of this game’s bonus features that the Planet of the Apes slot really bursts into life. 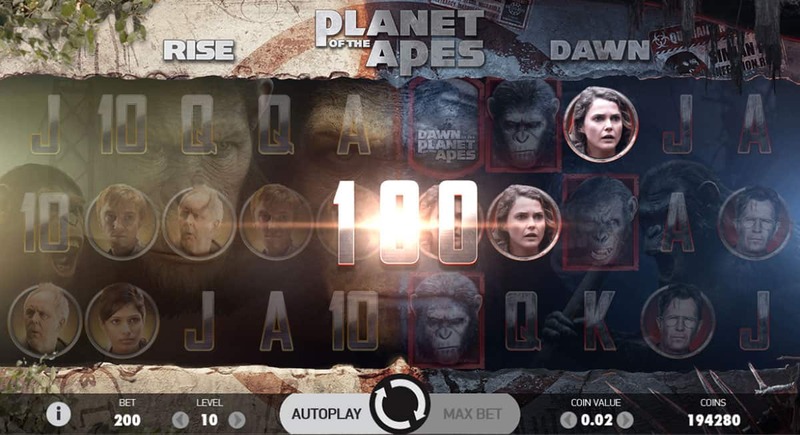 We are treated to key clips from the film to accompany our big wins, while NetEnt uses video animations - like a horde of chimps charging their way across our screen to launch the lucrative Dual Feature - to superb effect. The only gripe we could complain of sees the two top-paying symbols too similar, though Caesar bursts into snarling life when he completes winning combos to let us know exactly who’s boss. With two independent reel sets of 20 pay-lines each, we have plenty of potential to land big wins simultaneously on the reel sets. The randomly-triggered Dual Feature sees two symbols selected at random as sticky symbols for the concurrent spins. If either symbol lands in the opposite reel set, it transports across to the other. Even if our sticky symbols are low-payers, this feature can still result in legendary wins. The Rise and Dawn Bonus Scatters launch the Rise Bonus and Dawn Bonus when they land on reel 1 or reel 5 of their respective reel sets. The former pays out a coin win for every Human and Ape symbol that lands on the reels for the next spin. 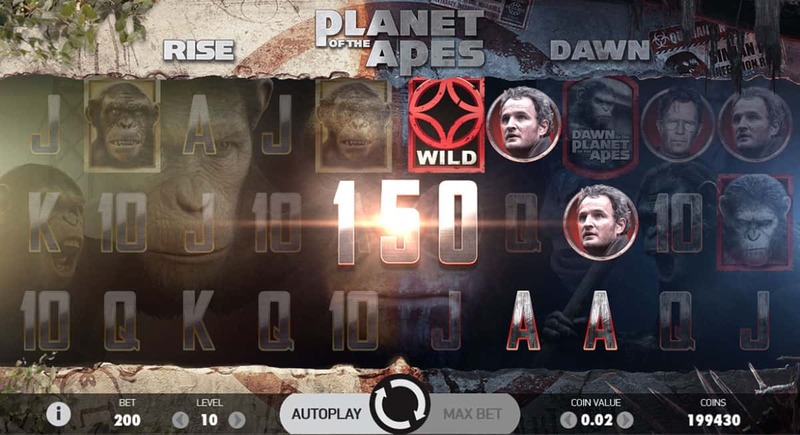 The latter turns all Human and Ape symbols into one matching symbol, offering multiple line wins for any combos that land on winning pay-lines. And then NetEnt goes and treats us to a Free Spins feature. Or, rather, two free spins features! One for each reel set. The Rise Free Spins triggers 10 free spins, in which all Wild symbols collect until the final showdown - one last spin with all of these Wilds added. The Dawn Free Spins, meanwhile, delivers 15 free spins. And now we have a chance to win extra spins, bonus multipliers and transforming symbols. Cracking. NetEnt has pulled out all of the stops to deliver an epic slot that is truly deserving of the description. 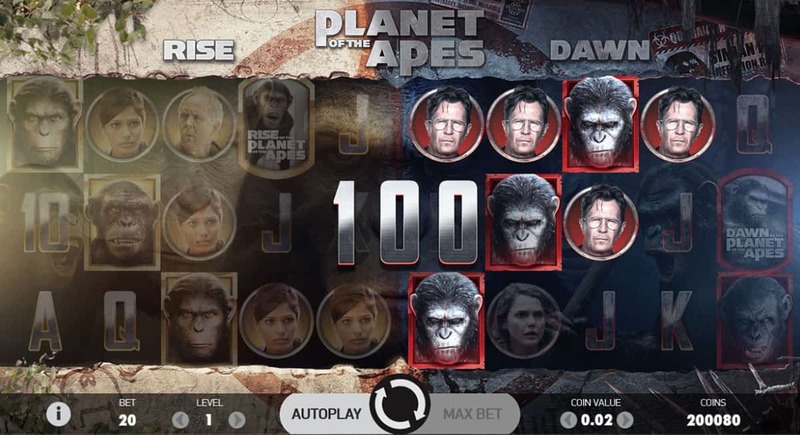 The thunderous soundtrack accompanies the game-play perfectly, while NetEnt’s clever use of clips from the film - along with other superb graphical additions - takes the slots play up a notch. Landing one or more of the bonus features is enough to ensure that we will return from this romp fully pumped and ready to go truly ape.